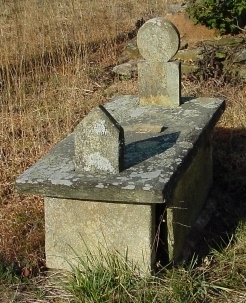 : an empty decorative stone grave shelter in the shape of a box with an oblong horizontal lid (ledger stone) of local soapstone (local greenish-grey soft chloritic schist) with two slots cut into it, through which the vertical head and foot stones are fitted, called a 'through mortise-and-tenon joint' in woodworking. 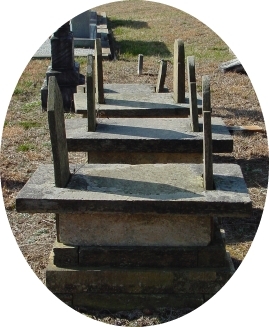 The ledger stone is thus suspended over an internal empty cavity by the weight-bearing shoulders of the head- and footstones, and by either (a) long cut stone blocks (squared-stone-logs) approximately 5"x5"x(~length of body), stacked one on top of the other equally on each side, or by (b) one-piece side slabs, to create an above-ground stone box monument that resembles a tomb. The body is presumably underground since no remains have been seen inside exposed internal cavities of broken or collapsed boxes. similar in purpose to the wolf (ledger) stone. almost exclusively in rural northeast Georgia around Wahoo. ethnicity: English & Scotch-Irish and predominantly Baptist. 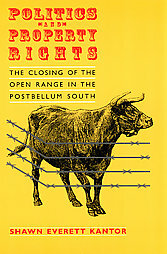 dates: 1848-1889, the latter corresponding with the closing of the state's open range and fencing of livestock in pastures. locally quarried & carved. - are these tombs related to look-alikes in the Middle East? The double-shouldered headstone is found as a remnant of the slot&tab tomb. The extra shoulders are used to support the slotted ledger stone. Know of another slot&tab site that isn't listed here? Hopewell Methodist Church Murrayville, Hall Co.
Town Creek Baptist Church White Co.
Mt Pleasant Methodist Church White Co.
wooden gravemarker/headboard, Chattanooga, Hamilton Co.
Hixson family cemetery, Chattanooga, Hamilton Co.
Zion Church Mt. 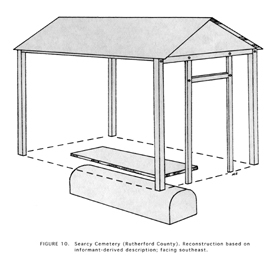 Pleasant, Maury Co.
"OBSERVATIONS ON THE FORM AND FUNCTION OF MIDDLE TENNESSEE GRAVEHOUSES", Donald B. Ball, Tennessee Anthropologist, Tennessee Anthropological Association II(1):29-62. 1977. An intensive survey of three contiguous Middle Tennessee counties (Cannon, Coffee, and Rutherford) has documented a total of 16 extant gravehouses in nine cemeteries plus to former location of several others. 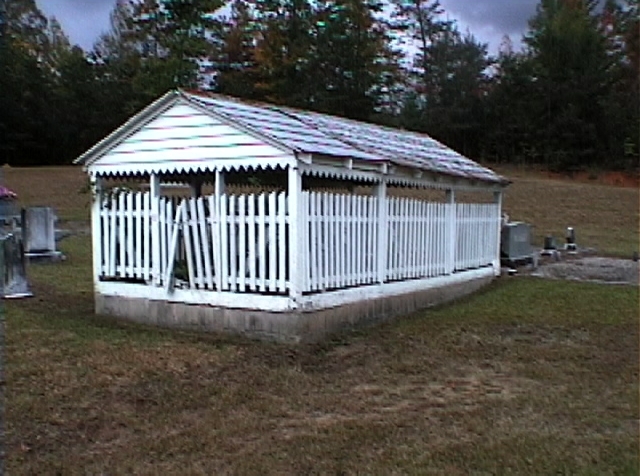 Built to cover an in-ground interment, these structures were found to exhibit a high degree of diachronic attribute similarity when recorded in detail and compared architecturally to one another. It is suggested that these structures represent a traditionally patterned mechanism for the tangible expression of sentiment on a personal, rather than social, basis. To place these little studied structures in a spatial and historical framework, data are presented pertinent to both their distribution in North America and probable European source area. 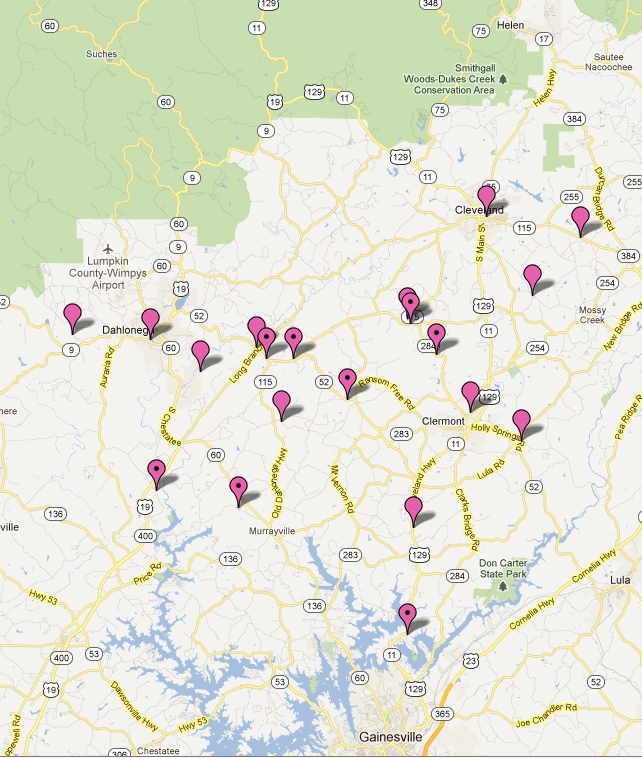 Southern Graveshelters and English Lych-gates: The Search for Culture Trait Origins, Gregory Jeane, Tributaries, Vol. III, Alabama Folklife Association. The tabletop tomb was a fad during the mid-19th century. "The people are buried in the ground, underneath the box tomb," Ruedrich said. "Yet half the box tombs I've worked on have had their tops taken off by curiosity-seekers looking for a body. So the more people who understand that no one is buried in there, the better off we'll be." - Dean Ruedrich, historic preservationist, Ruedrich Restorations of Bunn NC. & btw, what does S.T.K.S.H.T.W.S. mean? literally "empty tomb", from the Greek kenotaphion, from kenos empty + taphos tomb. A symbolic tomb, honoring the dead but not containing the body; often a tomb or a monument erected to commemorate a person or persons whose remains are elsewhere, such as soldiers buried abroad or sailors lost at sea. 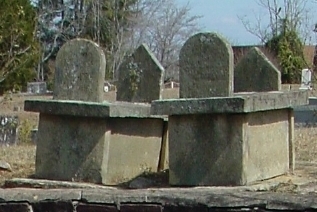 the top portion of a gravestone (or doorway) above the uppermost horizontal line. 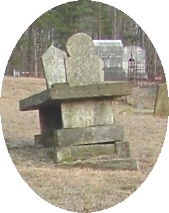 Traditional English and New England headstones had semicircular tympanums and footstones triangular typmpanums. 2 Neoclassiscal Revival (nineteenth to early twentieth centuries).